Value for money! Ground level spacious and bright 2 bedroom apt as part of the house, set up exclusively for the guests. Please note this is 2 bedrooms walkout basement apartment. Free parking for 1 car. Private entrance from the back of the house. The beds equipped with Posturepedic mattresses and deluxe linens. Quiet, safe neighborhood, cottage like setting with garden patio with big table and chairs backing to the picturesque wooded ravine, walking to trail. The home is located about 7 minutes from Canada's Wonderland Theme Park and from Vaughan Mills Shopping Centre. Walking distance to go GO train. WI-FI. Apt is very comfortable and functional with an open concept of a family room with a fireplace and a big full eat-in kitchen (fridge, stove). The kitchen comes fully equipped. It has modern furniture, a nice decor and has all the amenities of a great home, incl: parking, computer desk and chair, full bath with tab and shower. The suite is very comfortable and functional with an open concept of a living/family room 4 big windows that provides natural light, a fireplace and a big full eat-in kitchen. A fully equipped kitchen include a refrigerator, kitchen sink, a stove, microwave, coffee maker, toaster, silverware, dishware, cookware, and basic cooking utensils, dish cleaning supplies, garbage bins, some basic food items for guests to get going in the morning. It has modern furniture: sofa that sits 3, chaise, sofa bed (double), chair, computer table with a chair, a nice decor and has all the amenities of a great home, incl: parking, patio set. TV - has only Neflix, no cable. It has a lot of windows and completely private. Sleeping arrangements; 1 bedroom has queen bed, Second bedroom has queen bed, IMPORTANT: If booking is for 2 people we only open 1 bedroom, if you planning to use 2 bedrooms for 2 people, please book for 3 people. We can also provide single cot suitable for kids or small adults if booking for more then 6 guests. Contact us prior so we can prepare the space with proper bed arrangements. All linens are Freshly washed after each guest. In town for business? This place is setup with your needs in mind. We have self-check in option. It is a lot of windows, completely private. Entrance to the apartment located on the back side of the house. From drive way please take right path via steps that will lead you to the gate. Open the simple lock and the entrance on your left. We can interact in person or over text messaging. We are usually available should anything arise which requires our assistance. We want our guests to feel at home and we encourage our guests to let us know if there is anything we can assist with to help make their stay as enjoyable and comfortable as possible. The home is located about 5 minutes from Canada's Wonderland Theme Park and Vaughan Mills Shopping Centre. Vaughan Entertainment district (Colossus, Dave & Buster's, Yuk Yuk's, night clubs, etc) 10 min away Lots of great restaurants in the area. Walking distance to go GO train. Walk to Bus stop that goes to subway. You are 35 minutes to Toronto and about 90 minutes to Niagara Falls. You get a clean place, enjoy, but please keep it clean. People who are not part of reservation not allowed in the property. Use Exhaust fan when cooking. Keep glass sliding door closed to maintain temp inside the appt. If you need extra towels let us know. If you need extra pot or pan or other kitchen utensils, let us know. Hello, We are professionals and family of 3. We like to travel and meet people from different cultures and backgrounds. This apartment is convenient, clean and very well priced and suited for couples, families as well as business travelers. 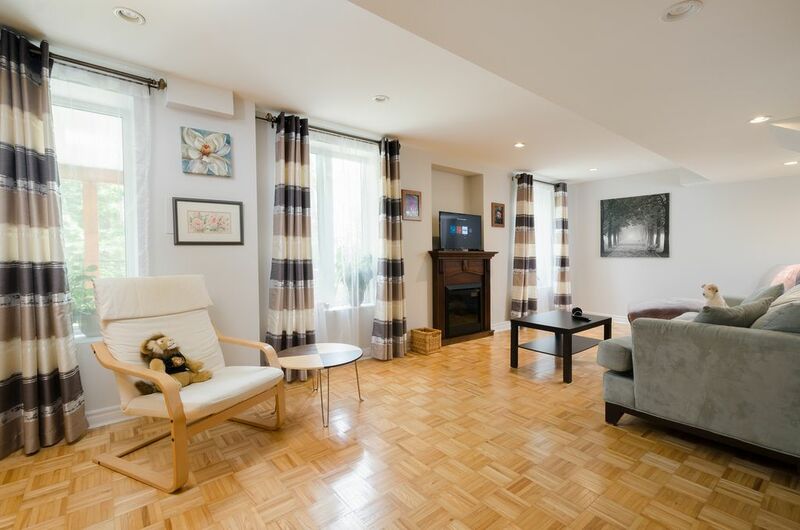 Cottage like setting in the city, Ravine, very private with patio table and chairs. water, coffee, tea, sugar, salt, olive oil and plus. has all utensils, pot, pan. we have additional chairs if required. The place is very very nice. The train station is within walking distance BUT in the winter if you are not used to -10c you might want a rental car. It takes about 30 to 45 minutes to get to downtown from the house by train. There is a grocery store named No Frills nearby, also within walking distance and awesome little Italian place as well with great food! The owners were very polite and respectful and helpful. Recommend. We were four colleagues staying for a course in Toronto at the property. The layout of the apartment is great and allowed for some private space for each of us. The owners are very caring. At our arrival we found main food items in the fridge and in the cupboards, which we did not expect. We truly did enjoy our stay at this clean and welcoming property and will definitely come back . We fully recommend this property. Thank you Paul and family. We had a very nice stay and very pleasant hosts. The house was 20 min from the airport and 20 minutes from the main mall and from Wonderland. Very authentic neighborhood and was perfect for our personal needs. The house was very clean, all necessary amentaties were included. Very quiet. Nice back yard. Very nice host and very responsive. Brought us extra towels and welcome fruite busker and answered any of our questions. We will stay there again if we visit the city again. Thank you! Margarita, thank you for taking time and write nice review. You guys are welcome to stay again just let us know. Best regards Pavel. Excellent flat, excellent location & excellent hosts. Had a great stay in this modern, clean flat with my family. Hosts are very friendly and accomodating. The location was great with easy links to Wonderland, Vaughan Mills and a number of supermarkets nearby. If they will have me back, i will definitely want to stay again. Thank you! Yes, you are welcome back. Just let us know. 2 brm apt is very comfortable and functional with an open concept of a family room with a fireplace and a big full eat-in kitchen. A fully equipped kitchen include a refrigerator, kitchen sink, a stove, microwave, coffee maker, toaster, silverware, dishware, cookware, and basic cooking utensils, dish cleaning supplies, garbage bins, some basic food items. It has modern furniture: sofa that sits 3, chaise, chair, a nice decor and has all the amenities of a great home, incl: parking, computer desk and chair, full bath with tab and shower. It has a lot of windows and completely private. Full bathroom with towels bath, shampoo, body wash, hair dryer, iron. Guest access Entrance to the apartment located on the back side of the house. From drive way please take right path via steps that will lead you to the gate. Open the simple lock and the entrance on your left. Guests can have access to laundry inside the house. The neighborhood The home is located about 5 minutes from Canada's Wonderland Theme Park and Vaughan Mills Shopping Centre. Vaughan Entertainment district (Colossus, Dave & Buster's, Yuk Yuk's, night clubs, etc) 10 min away Lots of great restaurants in the area. Walking distance to go GO train. Walk to Bus stop that goes to subway. You are 35 minutes to Toronto and about 90 minutes to Niagara Falls.